Brothers are always close, but Roderick and Robert Mcleod of Philadelphia have a special bond. Roderick has been assisting Robert as a family caregiver for the last six years, five of which have been with Hands From The Heart Home Healthcare Services. 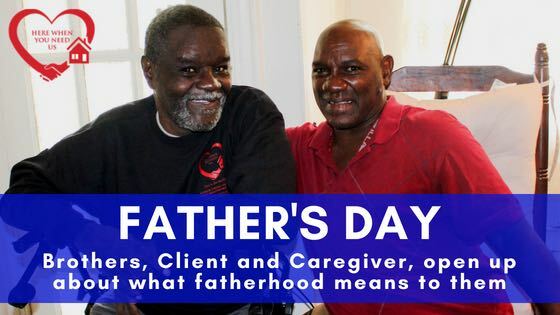 In celebration of Father’s Day, we took some time to talk to the two brothers and ask them about brotherhood, family and fatherhood. Not only are Roderick and Robert brothers, but they are fathers as well. Roderick has a son, who recently graduated from Penn State, and Robert has three sons, all of whom have children of their own. For the Mcleods, Father’s Day is a time to simply relax and enjoy sharing time with loved ones. Every year on Father’s Day, Roderick and Robert’s sons visit them and spend the day catching up, sharing family meals and watching sports together. Roderick’s love of the Dallas Cowboys has earned him the nickname, “Cowboy,” amongst the staff at Hands From The Heart. Roderick shared the story of how he got his namesake with us. Roderick told us about how well he and his brother have gotten to know the staff at Hands From The Heart. To read more about Hands From The Heart and our wonderful clients and caregivers, click here to view the rest of our recent blogs. To sign up for our monthly newsletter, join here or visit our Facebook page today. Hands From The Heart Home Healthcare Services specializes in providing non-medical home care services to seniors, veterans and individuals who are disabled. Our services help those in need stay active and independent in their homes. We hire family caregivers, just like the Mcleod family, to provide these services to their loved ones in the home.